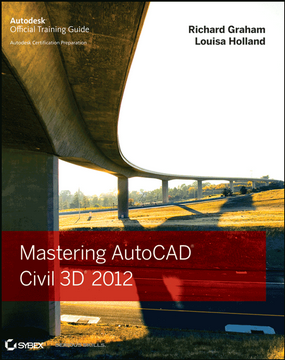 It is not a stretch of the truth nor is it a new find that managing styles, settings, and templates has been daunting with Civil 3D. Then with each additional release there are improvements made to the existing styles and settings and new styles and settings added. Actually with Civil 3D 2010 SAP there were new styles and settings added MIDSTREAM! I have seen many different methods of how CAD Managers manage this. In fact, there was a post here way back last June asking the community how they managed their styles and settings. 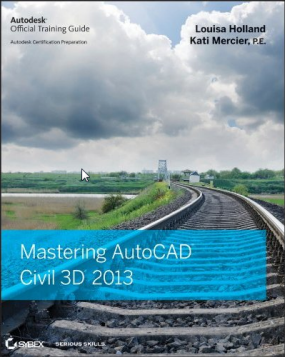 Autodesk even recognizes a need to provide tools to assist in managing all of these details. However, currently the most common management method is to have one template for ALL. This is a great way to manage styles but not so great with settings since different types of drawings (Road design versus site design versus drainage design versus storm profiles versus road profiles) require different settings. And that does not even get into different settings and styles for different jurisdictions which IS REQUIRED RIGHT NOW. For example, one jurisdiction may require parcels to be laid using the setback distance as the minimum width while the neighboring jurisdiction requires parcels to be laid by parcel frontage. How do you handle multiple settings? You can’t store them all in one drawing. Do you keep ALL your styles in one template which could lead to huge drawings with tons of unnecessary data? In the post above the community census was that there should be some type of external settings and styles management system – similar to a database. From there you can pull ‘themes’ of settings or just grab what you need. I have been working on a software to do just that for over six months now. With so many settings and styles (and I keep getting sidetracked by real work) it took a little while to build and a lot of testing. However, we are excited to release InMotion’s IMC3D Settings Manager!! The IMC3D Settings Manager 2010 (2011 version coming soon) takes the styles and settings that you select and exports these to an external compressed settings file. This file will be able to traverse versions with no problems since ultimately these styles are created from scratch any time they are imported. 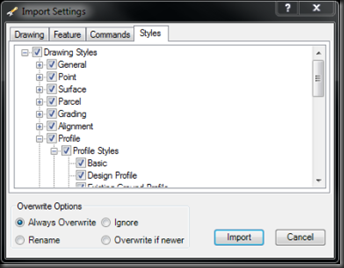 When you are ready to import the settings or styles, select the settings file and then select which settings and styles you want to import from the settings file. 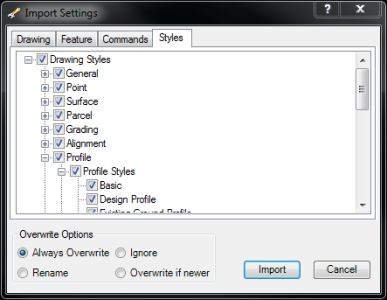 CAD Managers can even automate the revisions to styles in existing files by calling the command line version of ImportC3DSettings (just add a “-“ before the name) and the function will import all within the settings file. Thus the CAD Manager can just export the revised style(s) or setting(s) and then create a lisp or script to run this command and all files are updated! We are VERY EXCITED about this software and think you will be too. You can download and install IMC3D Settings Manager for free for 30 days (For more information about the software, Registering, and Purchasing you can go to our website at http://inmotioncon.com/c3dstgs.shtml). Let us know what you think. So if you had downloaded the installer you may need to download it again. Sorry about that. Lesson: Never make ‘small’ changes right before you release software. It’s VERY nice!! I have wanted to rebuild my template for a couple of releases now since it dates back a few more releases but I know I can’t convince the boss to pay me for it. I saved a config from the old template, started a new dwg from acad.dwt & imported all of the styles and settings in seconds. The over-write and feature options provide a lot of flexibility. Does it handle child styles on both the import and the export? Yes, It handles child styles. Since they are a child of the parent they will import and export when the parent is imported/exported.